tips & tricks for catching Panfish. Bluegill are found in shallow water near piers, sunken cover, and weeds. Crappie prefer shallow water in the Spring and will school in deeper water as the Summer progresses. Look for weeds. Any time is a good time for Panfish. Bluegill and Crappie will be active throughout the day, while Crappie feeding intensifies around dawn and dusk. Panfish prefer both live and artificial baits. Favorite lures include small spinners and rigged jigs. Bobber rigs are excellent for both Bluegill and Crappie. Bluegill prefer small worms and crickets while Crappie prefer live minnows. Use the splitshot to balance a stick float vertically. This makes it easier to detect strikes. With bobber rigs, hook minnows through the top end of the back behind the dorsal fin. This allows the minnow to remain lively longer. When jig fishing, hook minnows through the lips. 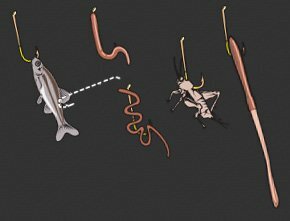 When fishing a rigged grub, retrieve the bait at a speed where you occasionally touch the bottom, but are not dragging your bait along the bottom. Here are some popular approaches to Panfishing. This is an excellent rig for light-biting fish. It is easy to detect bites and it offers less weight and less resistance to the fish. Attach stick float to line 12-in to 36-in from hook. To fish these lures, cast and let it sink to the desired depth, then retrieve steadily. Pass hook of jighead through shad or grub as shown. This is a good all-around lure for crappie, who are attracted to its slow-falling action. Insert the tube jighead through the tube. Push the eyelet through the tube head. Thread hook through worm, or you can pierce it several times and coil it.